The first astronauts to visit Mars may pass through snow flurries as they descend on the Red Planet's surface. 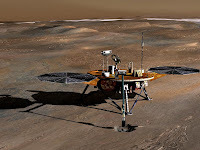 According to a report at New Scientist, NASA's Phoenix Lander detected snow 2.5 miles above the Marian surface using its lidar detector. Lidar? Yeah. It's like radar, but it uses laser light instead of radio waves to detect things. Don't plan on astronauts building martian snowmen. Reason one, the snow vaporizes before it can make it to the ground. Reason two, Republicans in congress would use an episode like that to show how wasteful the space program is. It could be the last time America sends a man or woman into space.